Accidental contact with live electrical wires can cause serious external and internal injuries, if not death. These accidents are often associated with industrial and construction worksites, but they may also happen in other workplace or recreational settings. The law firm of Taylor & Ring represents individuals who have been injured by electric shock as a result of another party’s negligence. Our attorneys have the demonstrated ability to win justice in cases of catastrophic injury. Our experienced Los Angeles electrical accident attorneys have recovered compensation for clients in some of the biggest personal injury and wrongful death cases across Southern California. If a loved one has suffered serious and lasting injury from electric shock, we will pursue compensation for medical care, lost income and other collateral damages. Severe burns. Burns from electrical shocks are generally more severe than standard thermal or chemical burns. This is because severe burns from an electrical shock damage tissue within the subdermal layer of skin. 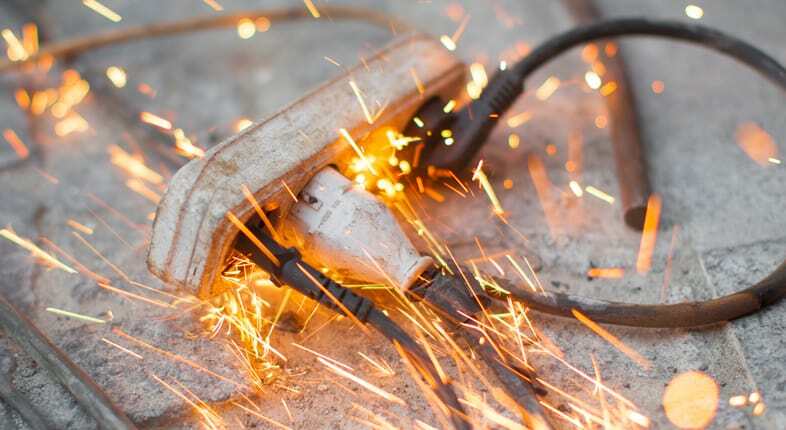 Even when there are no visible external burns, an electrical shock victim may have internal burns affecting organs and tissue within the body. Nerve damage. An electrical shock can severely injure the nerves of the body, by damaging tissue within the nervous system. Brain damage. Electrical shock can cause extensive damage the central nervous system, which includes the brain and spinal cord. Brain damage may be mild, resulting in a temporary loss of consciousness, or severe with long-term cognitive deficiencies. Heart problems. An electrical shock can act as a fibrillation, causing vascular damage to the heart. Bone fractures from falling. The violent nature of an electrical shock can cause the victim to lose balance and fall. Some shocks are so severe that they can throw the victim across the room. When this occurs, the individual may suffer broken bones or fractures. Emotional trauma. The traumatic and unexpected nature of an electric shock can have extensive emotional effects. Post-traumatic stress disorder is common among shock victims. Wrongful death. Electrical shocks are sometimes so serious that they are fatal. Wrongful death may occur immediately or from additional complications down the line. Electrical shock cases can prove challenging to investigate. These matters require representation from attorneys with the knowledge and skill to successfully advocate for the rights of victims. Our attorneys have handled many scenarios of electricity accidents and electrocution deaths, including those involving construction workers, utility workers and others coming into contact with exposed wiring or high-voltage lines. Adequately investigating these matters requires an understanding of industry standards and best practices. Whether the circumstances are job-related or not, we have the resources to hire professional investigators who can identify the negligence of property owners, utility companies, landlords, construction contractors, manufacturers or other parties who may hold some responsibility. Neurological injuries. These central nervous system complications often arise days, months or even years after an electrical shock injury. Weakness at the location of the shock is a common complaint. Psychological injuries. Electrical shock patients often experience behavioral changes, along with memory deficits and increased aggression, as long-term effects of their injuries. Researchers have found that these conditions often mimic the symptoms of a traumatic brain injury. Eye injuries. A small percentage of electrical shock victims develop cataracts within the first year of their injury. This is particularly true when the head is the site of initial electrical contact. Chronic pain. Even with extensive treatment, some electrical shock patients experience chronic pain throughout the rest of their lives. Our knowledgeable Los Angeles personal injury lawyers understand the magnitude of these complications and the extensive cost of long-term treatment. We work to ensure that electrical shock clients get the best medical care possible, while striving for full compensation for their losses and ongoing hardships. Our legal team works with the victim’s family and many professionals to detail the past, present and future impact of the injury, including surgery and burn care, pain management, physical therapy, counseling, lost earnings, vocational rehabilitation, pain and suffering, and reduced quality of life. Taylor & Ring has obtained notable recoveries for victims of electrical shock accidents. We are committed to compassionate support and aggressive representation in pursuit of justice. For a free consultation with experienced trial lawyers with proven results, call us at 310-776-6390 or complete our contact form.